UK, 2015, 100 minutes, Colour. Leo Howard, Gale Harold, Michelle Ryan, Antonia Campbell- Hughes, Skin, Alex Martin, Alec Baldwin, Danny Glover. 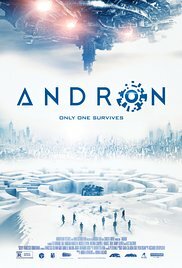 Andron is set in the year 2154, a post-apocalyptic era when most of the human race has been destroyed. The survivors are now slaves to an oligarchy. This film is very difficult to sit through, let alone to try to work out plot and character details. It has clearly been influenced by films like The Hunger Games, authoritarian tyranny, young victims, cruel games for survival. The film opens with a number of young people awakening in a dark labyrinth, no memories. While the film does give some focus on the difference in characters, it is still difficult to work out who is exactly who. Basically, there is a group of 10, men and women, initially fearful and bewildered, then being given some memories, building up to clashes and fights amongst themselves. There are also some highly masked and disguised soldier figures who attack the group at various times leading to elaborate fight sequences. The action is fairly repetitious, the focus on particular individuals, their clashes, fights, deaths, banding together. It emerges that the population is watching these games and making bets, surviving if they are choice for their wager wins. Quite a lot of action, some special effects – and quite artificial for the general overview shown at times of the world which has survived. No one, for instance, on the IMD blog had any good word for this film.